Whilst we make more handmade engagement, wedding and commitment rings than anything else, at times we are asked to make something a bit different. These are usually very special commissions that represent something unique to the wearer. The reasons vary; a significant anniversary, a new baby, the loss of a loved one or a beloved pet or ‘just because’. Whatever the ‘why’, we’re always delighted to work on them. We’d love to work on your unique piece with you too. Handmade pendant face engraving. 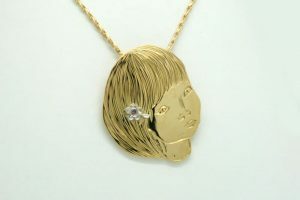 Recycled 18 carat yellow gold and platinum with an Argyle pink diamond and recycled gold chain. 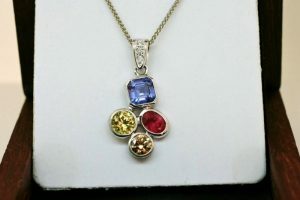 This beautiful and highly personal pendant came about when we were approached to make a gift for our customer’s wife. Turns out not only was she a surgeon, but also an aspiring children’s author and a talented illustrator. With a little bit of research we found a sketch she had done of her young daughter, and that became the inspiration for this truly unique piece of jewellery. We added our own flourish with a handmade flower pendant. This was made with recycled platinum with a tiny Argyle pink diamond in its centre. This is a very touching story that shows great compassion. Our customer’s wife had recently died after a long illness, leaving not only him bereft, but also his wife’s best friend of many years. As a very thoughtful memoriam, our customer had us recycle some of his wife’s jewellery into this heartfelt and meaningful pendant as a gift for his wife’s friend. Read the whole story here. 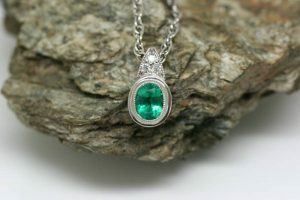 I received my beautiful paw pendant yesterday it is more stunning then what the pictures make it out to be. Thank you to Melinda and Chris for doing such an amazing job on the pendant. Melinda you are so easy to work with and always there to answer any questions or changes of mind in design. You make beautiful jewellery and know how to not just give value for money but also know when the project just needs that little more pop to make it look amazing. Thanks again for my beautiful pendant I highly recommend anyone make inquires through Melinda and you will not regret the jewellery you get from her and her team. 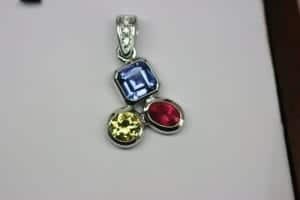 When we first made this pendant, it featured birthstones for mum, dad and their first born – Tanzanite, Fair Trade Ruby and Queensland yellow Sapphire. With the arrival of baby number two, we added another birthstone – an Argyle (Australian) Cognac diamond. This sweet little pair of earrings represent a something of a milestone in this couple’s relationship and were created via a unique design process. Our customer commissioned them for his wife’s 70th birthday. Not only was the whole transaction conducted by landline using ‘word pictures’ (he had no mobile phone or email) but it was the first piece of jewellery he had ever purchased for his wife in their almost 50 years together. I was surprised to unwrap not only a beautiful accessory, but one that featured a drawing I knew by heart – one of (my daughter), sketched from a picture, missing her while I was away at work. The reason why I’m sharing this is because the gift was lovingly made by Melinda Bailey and her team at Ethical Jewellery Australia. 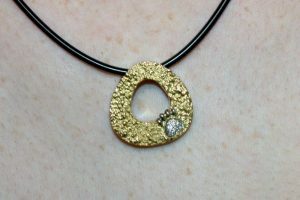 18 carat recycled yellow gold pendant with an inset recycled platinum paw print on a neoprene necklace. This sweet little pooch captured our hearts. Smaller than a soft drink can when she was first introduced to us, she was rescued from a breeder who wasn’t prepared to go through the time, care and expense to deal with all of her medical issues. We followed the story through Melbourne Animal Rescue’s facebook page and gifted them with this pendant to help with their fundraising efforts. 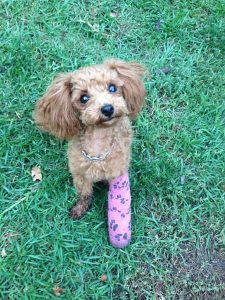 Noodle has had many health challenges throughout her life, but she was cared for and adopted by a member of Melbourne Animal Rescue and is a much loved member of her family. 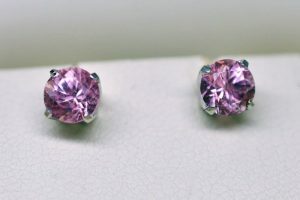 These gorgeous bubblegum pink Californian tourmalines were the perfect thing for a sweet sixteen gift. 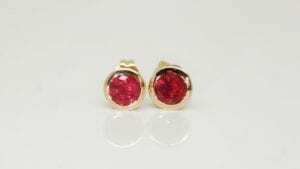 Handmade birthstone earrings – doesn’t get much sweeter than that. 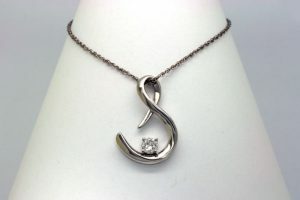 This simple and elegant pendant was the perfect 40th anniversary gift. 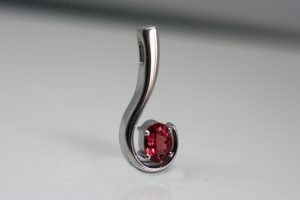 Handmade in recycled 18 carat white gold and set with a stunning fair trade ruby. Cat’s paw pendant featuring a NSW blue sapphire and Argyle diamonds for the toe beans! Our customer wanted to combine her two loves – special jewellery and her animals. 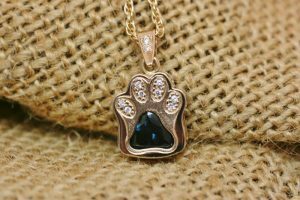 This paw pendant was created to showcase both. The deep blue Queensland sapphire and sparkly Argyle origin diamonds come together in this one of a kind piece, handmade in recycled 18 carat yellow gold. The birth of this couple’s first child prompted a special gift. We had originally worked with the couple to create their engagement and wedding rings. The beautiful engagement ring was made from one of six pieces of emerald rough we were fortunate to acquire and have cut. It was found in a private cattle property in a remote part of Western Australia. Gem exploration did not continue, so this remains the only pieces we are likely to have. It seemed fitting to use our last piece to make this sweet pendant. The design follows the details in the original engagement ring. 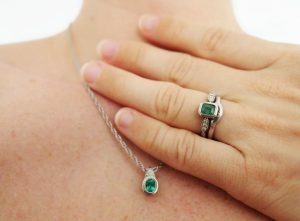 Western Australian Emeralds and (Argyle) diamonds handmade in recycled palladium. Designing and making jewellery like many of the pieces shown above is something we’d love to help you with. Feel free to email us (preferred) or give us a call at 07 3369 2596 if you’d like to talk through what you have in mind. Please bear in mind it’s difficult for us to estimate pricing on projects like these as it’s only once the design is largely done that we can give you and accurate idea of cost.